I have a sense of unfairness while reviewing Knock, Knock as I read it on the heels of a far deeper novel and the prose here pales in comparison. I'll be as objective as possible, while being subjective as necessary. Fantasy/Horror, with no other pretensions. The scene is an impoverished town in northwest USA, near Seattle, but the ambiance could just have easily been anywhere Appalachian or backwater, Deliverance banjo dueling Tennessee. After awhile, those kind of towns are difficult to find interesting. Does hillbilly witch lore exist in the northwest? It would feel more authentic if the ritual details sprung from an American Indian heritage. In any case, additional details of the spells, herbs, and superstitions would have helped deepen the effect. But I digress. Desperation. Poverty. Accents. Lack of education. Got it. Placement of the story during a time of transition when witchcraft is essentially dying out is interesting. The generational baton was passed to Marietta, and rejected. In fact, her family's magic appeared no stronger than snake oil, at which point I wondered whether the novel would go the way of Witches on the Road Tonight, where the witch lore was revealed to be mere superstition and stage shows. Miskowski, however, toys with the idea a bit before whipping off the veil and revealing that the evil in her novel is quite real. By this time, the lone witch is over her head and the final battle fulfills the promise that was fumbled in Witches on the Road Tonight. Like The Exorcist, we are left with the chilling thought that upcoming generations have no protection against evil entities with a maniacal desire for life. All that, and murdered children, babies, and puppies. How could I not care? 3.5 stars. Perhaps it was the writing. While adequate, and edited---nothing magical. Far too many repetitious phrases used to describe certain characters or situations. I winced and wished Miskowski would had reached more often for a thesaurus. That is the unfair part. I've allowed previously read novels to hinder my enjoyment of this one. 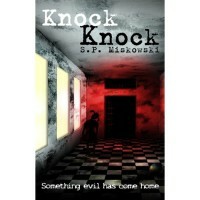 Still, Knock, Knock is a worthwhile read for witch lore horror fans.